Our 10 months of waiting was finally over! Our much anticipated trip to southern Spain was finally here. We left Vancouver on July 18th and after 24 hours of travelling, finally landed in Madrid the following afternoon. We had a small nap in our hotel room, but we didn't want to sleep too much or else we'd be awake all night. We often find it best if we just plunge into the time zone we've landed in. We found out there was a shuttle bus going from our hotel to downtown Madrid for the evening. The only glitch? It left the hotel at 8:30pm and wouldn't pick us up in the city centre until 12:45am. I was a little unsure of this as I didn't know if I could stay awake that long. But Joe said, "Come on, it'll be fun!" So off we went to explore Madrid for a few hours. We wandered the backstreets of town until we came to a very loud, very crowded tapas bar. "This is it!" said Joe. He waded into the throng of locals, ordered 2 beers and tapas in his best high school Spanish and we were off to the races! The Spanish have a curious custom of throwing used napkins and toothpicks on the floor when eating and drinking at the bar. We had a great evening wandering around Madrid. But staying awake until the bus came to pick us up at 12:45am was very difficult for a certain someone who had been awake for a long time. So Joe did what he does best. He fell asleep. On my shoulder. On a park bench. On a busy downtown street of Madrid. And I did what any good wife would do. I took a photo of him. Our next stop was Cordoba. An ancient city full of Moorish and Roman influences. 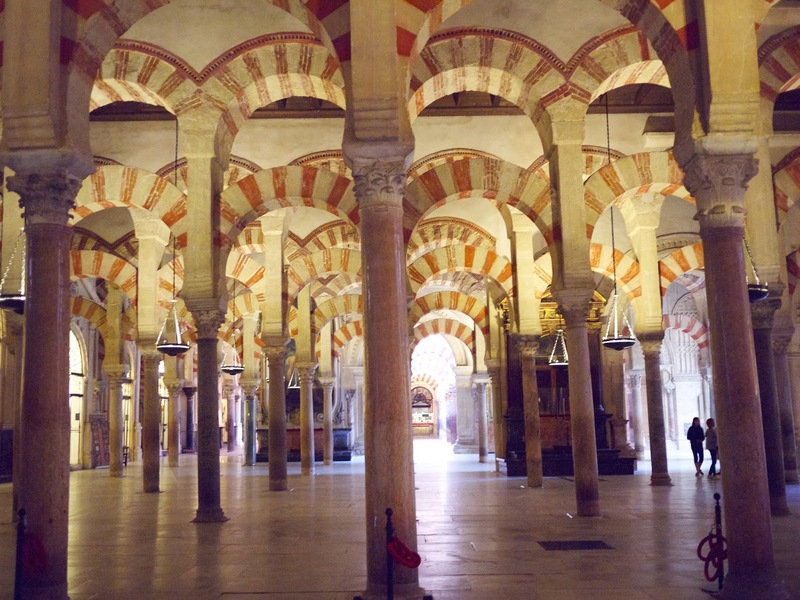 The Mezquita, a ancient mosque-turned-cathedral. A mere 3,000 pounds of multicolored glass and enamel cubes panel the walls and domes of the Mezquita's mosque. 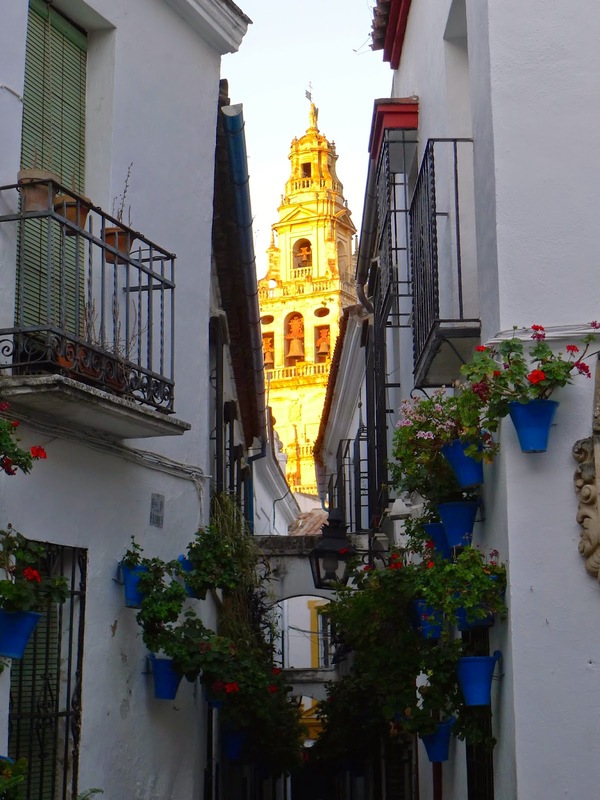 The cathedral's bell tower as seen from Calle de Flores. 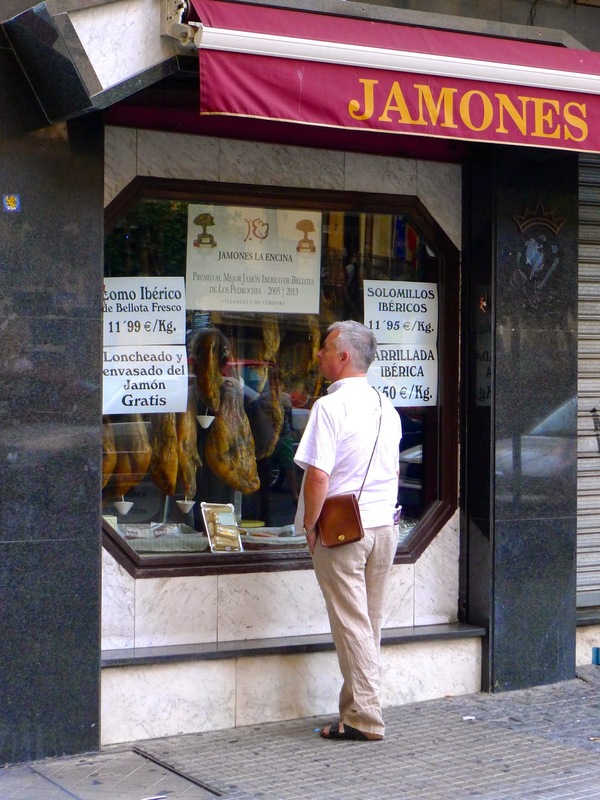 Joe gazes longingly at the Iberian hams hanging in a shop window. His dream is to smuggle one of these babies home with him, complete with the slicer stand. The Spanish eat dinner at 10:00pm. We happily adopted this custom. We love going to bed with full stomachs. Spain agrees with this guy. Next stop, Sevilla! 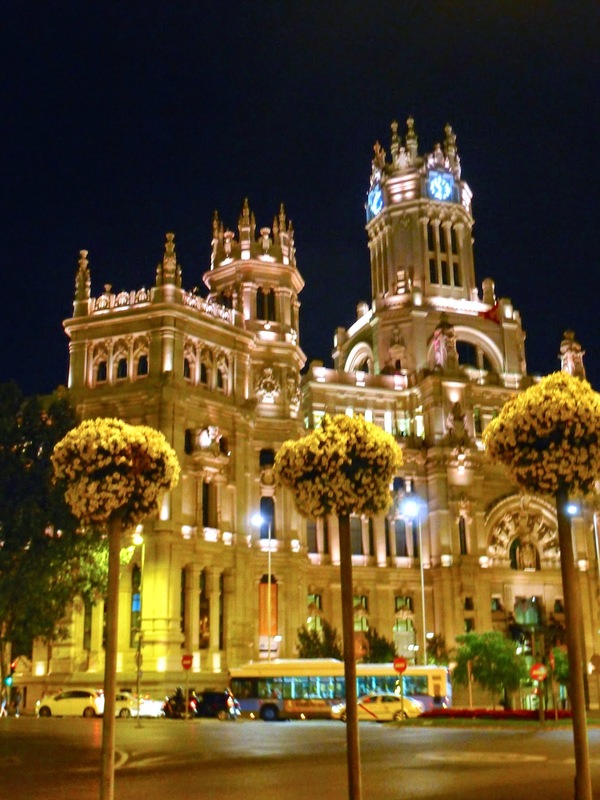 A flamboyant city of bull-fighting, flamenco and tapas. We enjoyed staying in the old Jewish Quarter for a few nights. Our hotel Las Casas de la Juderia. The hotel's rooftop pool. Joe had it all to himself one afternoon. For about 8 minutes. One night we luckily stumbled upon a street festival celebrating Santa Justa and Santa Rufina, the patron saints of Sevilla. Iberian hams hang everywhere. In bars, in shops, in restaurants. 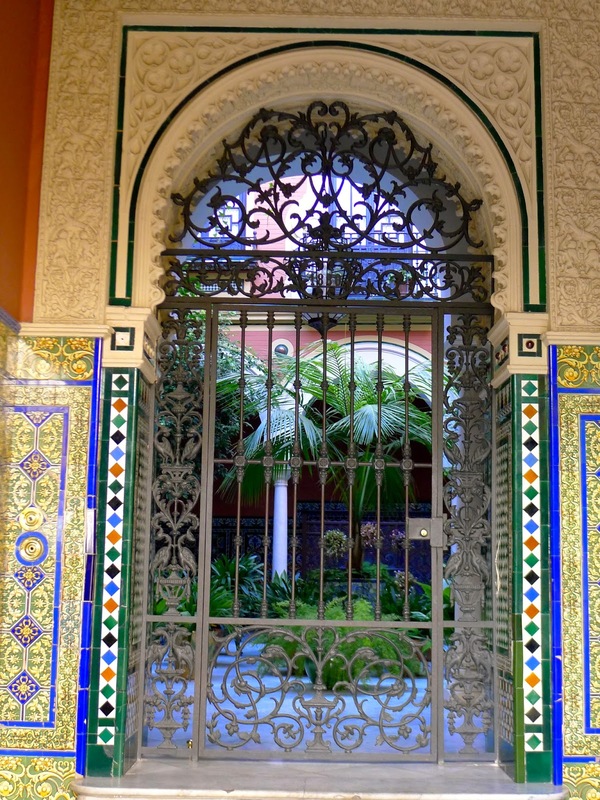 Beautiful grilles let you look into the gorgeous courtyards and patios of Sevilla's homes. 'The Mushroom'. Locals either love it or hate it. 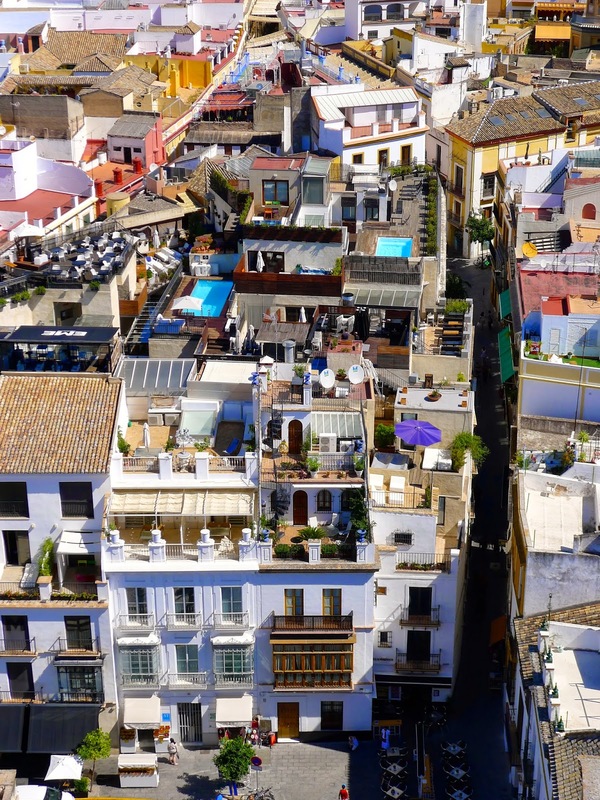 A bird's eye view of colourful Sevilla. Sevilla's flamenco scene is HOT HOT HOT! The best tapas we've eaten so far was in Sevilla. This tapa is an egg yolk on a bed of minced mushrooms sitting in a reduced wine sauce. It was absolutely DELICIOUS! I could have eaten ten. It is so hot here in the summer many of the plazas and streets are shaded. On top of 'The Mushroom'. And that, my friends, was our first week in Spain. Good grief, I love this country.